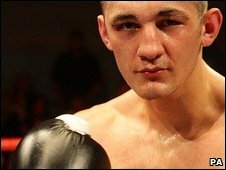 Commonwealth light-heavyweight king Nathan Cleverly says his growing punch power can take him to a world title. A surprisingly easy second-round win over Billy Boyle was the 22-year-old's third successive stoppage and his sixth in an unbeaten 16-fight career. "Power is increasing as I grow into the weight... I wouldn't be in the sport if I didn't think I could go on to win a world belt," said the Cefn Fforest man. Next up is a bout for the British title against Danny McIntosh on 18 July. The showdown will be on McIntosh's home ground at the Esporta, Norwich, for the belt vacated by Dean Francis. McIntosh, 29, has only had 10 professional fights, but, like Cleverly, he boasts a 100% record. "I've been knocking on the door of the British title for a while, now I'm ready to bring it home," Cleverly told BBC Radio Wales' "The Back Page" programme after Friday's win over Boyle at the York Hall. "But I want to be world ranked eventually, that's why I'm in the game," added the Welshman, who has been linked with Sheffield's former world champion Clinton Woods as a possible future big-name opponent. While the boxing skills of Cleverly have always been recognised, the punching power of Joe Calzaghe's former sparring partner had been questioned. But that now seems to be changing, none of his last three fights having gone beyond four rounds. "I've got plenty of rounds under my belt from my early career, and that's not necessarily a bad thing," said Cleverly. "Now the stoppages are coming as I've inevitably grown into my weight and matured with age. "It's just natural development, you have to be patient and allow yourself to strengthen up fight by fight. "The stoppages are flying in for me now and I'm very pleased. "The Boyle win was a bit earlier than expected, though, I was just warming up." Cleverly's mind is now far from boxing, though, as the Cardiff University maths student returns to his books. "It was a busy week [last week], I had an exam on Tuesday that went well," said Cleverly, who claims he would hang up the gloves and use his qualifications if he did not believe he could win a world title. "There are two more exams next week, I just want to finish them off to cap a successful year."